This month I was challenged to make something using paint. 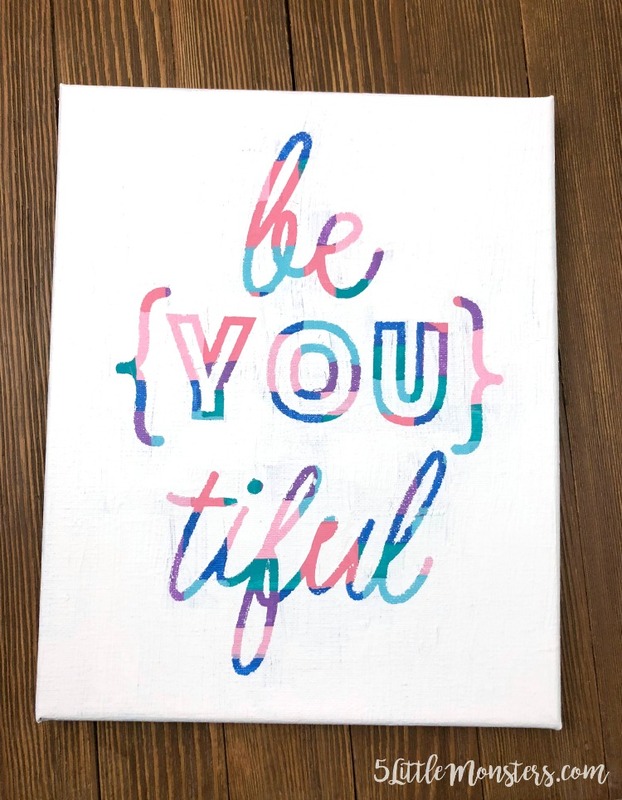 I have been seeing hot mess canvases recently in a lot of facebook craft groups that I am in and I decided to give it a try. 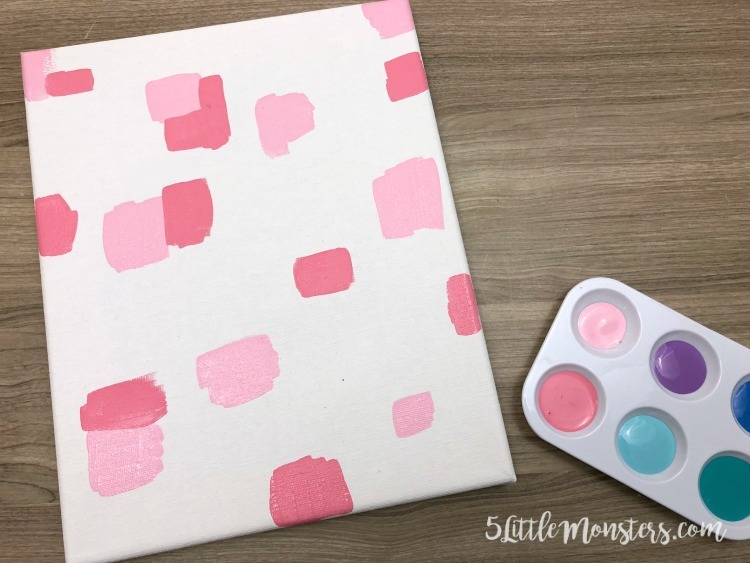 If you are not familiar with the hot mess canvas technique let me tell you what it is. In elementary school did you ever make an art project where you would color all over a paper with different colors of crayons and then cover that with black crayon or paint. Then when you scratched the top layer of black off the rainbow of colors would show through. This is kind of a grown up version of that. You start with a blank canvas and cover it with paint in lots of colors (I used 6 different colors). You can paint it however you want. I made random small squares and rectangles of different colors until it was covered. 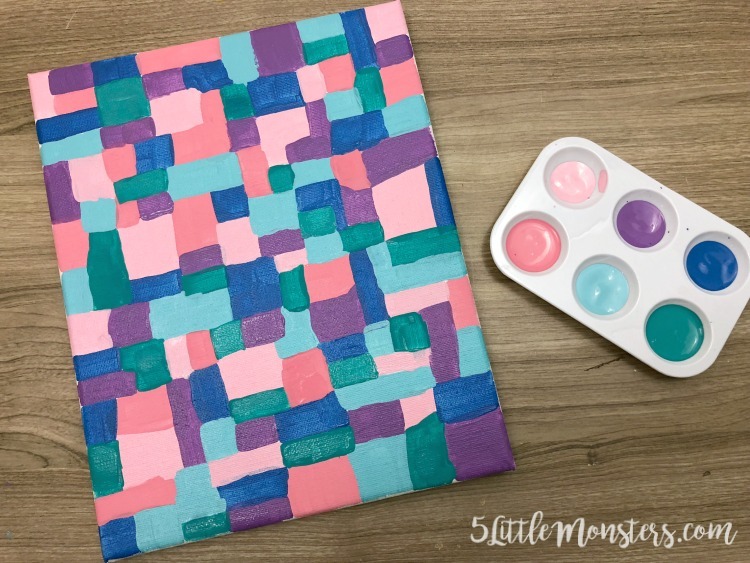 You could do squares, stripes, an ombre design, or even hand the canvas to your toddler and let them paint it. The main thing is that you want the canvas covered, especially in the area your design will go. 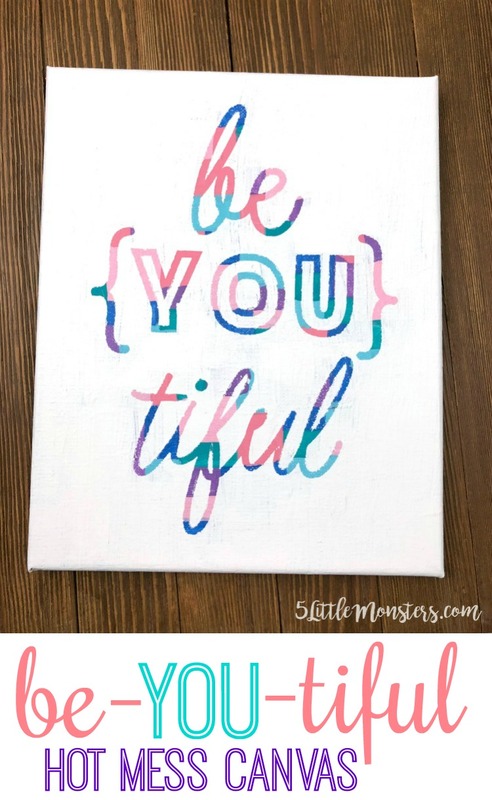 Then you will cut a design out of vinyl and place it on your colorful canvas. Make sure your paint is really dry. I made the mistake of trying to rush mine and I didn't let it dry as long as I should have and there are a couple of places some of the paint peeled up a little as a result. Make sure that the vinyl is stuck down really well so no paint goes underneath of it. Paint over the entire thing with white paint, or whatever color you want the main part of your canvas to be. Just make sure there is really good contrast between the colors you used to paint your canvas in the first step and the color you use to paint over everything. My 6 year old watched me do this step and she was very concerned when I painted right over the top of the vinyl. She thought I had made a mistake, I told her to just wait and see. 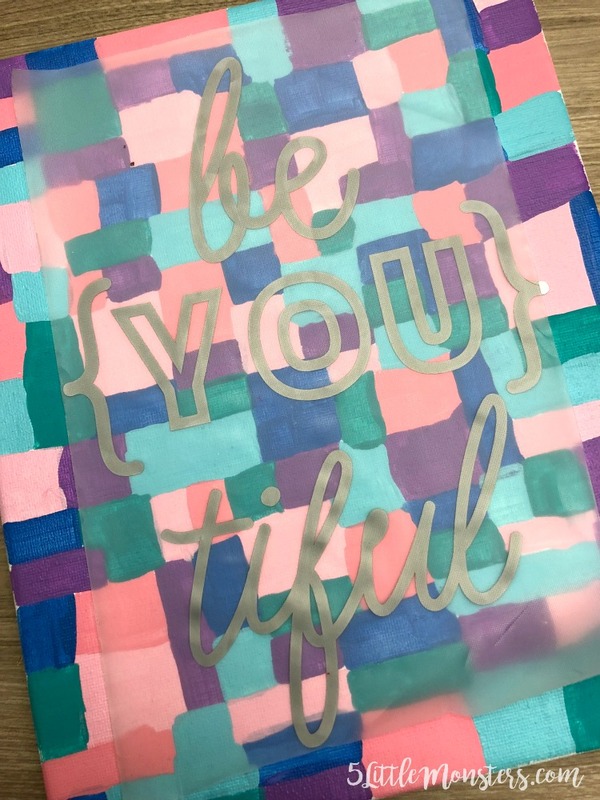 Peel up the vinyl to reveal the colorful design underneath. My daughter was so excited by this part. She went from thinking I messed up to begging me to let her make one of her own. Which I let her do, she made a unicorn. I made my canvas with my girls room in mind. 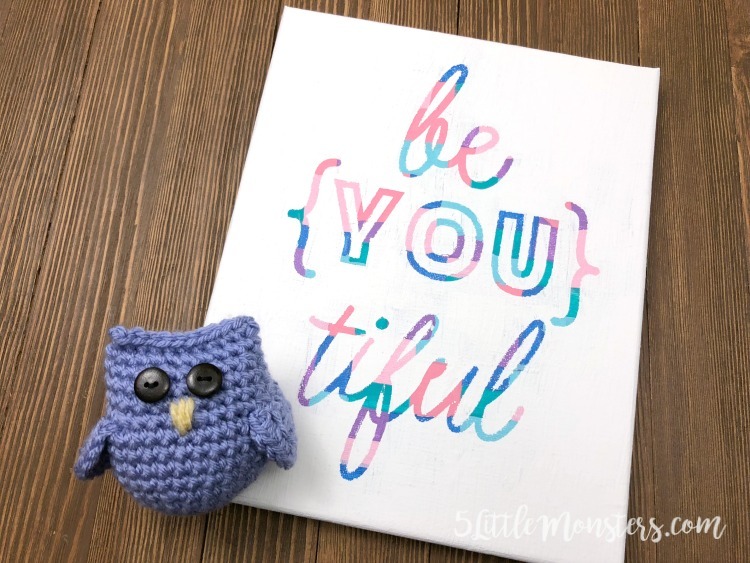 I had been wanting to make them some wall decor that would have good, encouraging, uplifting things for little girls to hear. I thought this was a fun project that fit that description. 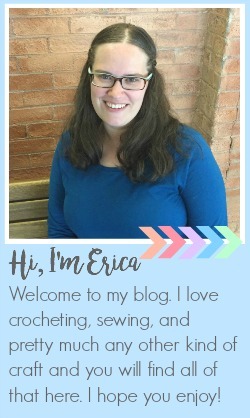 I am sharing the design space file below so if you have a Cricut you can make your own. 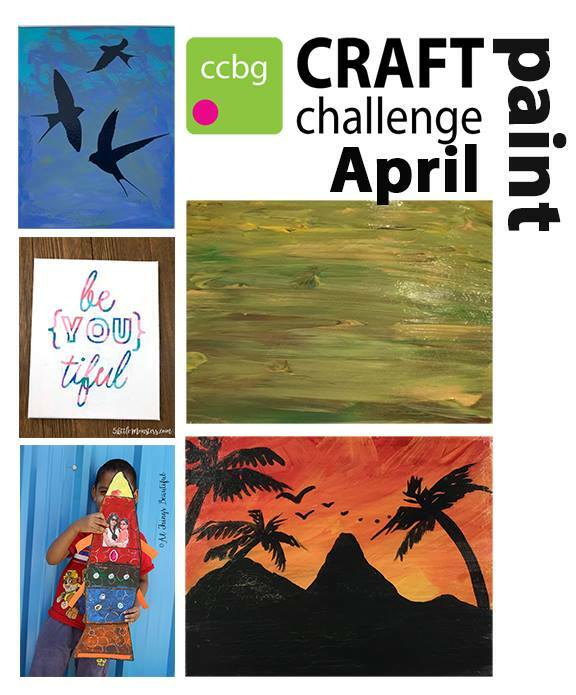 First choose your paint colors and paint all over your canvas in whatever pattern you want. Small sections of each color works best so that you get a lot of variety and the end of the project. I used a flat brush to paint the color on the canvas. Once you are happy with the color placement and the canvas is fully covered set it aside to dry fully. You will want to make sure it is completely dry before you move on. I tried to rush a little bit and it wasn't dry enogh so some of the paint peeled up. 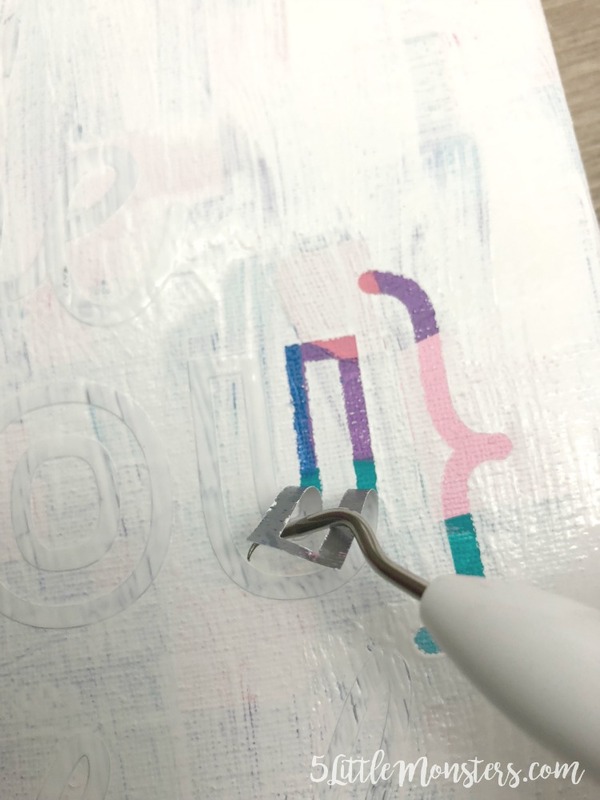 Cut out your design from adhesive vinyl using this file, use transfer tape to apply vinyl to the canvas. Rub it down really well so that the paint can't get under it. 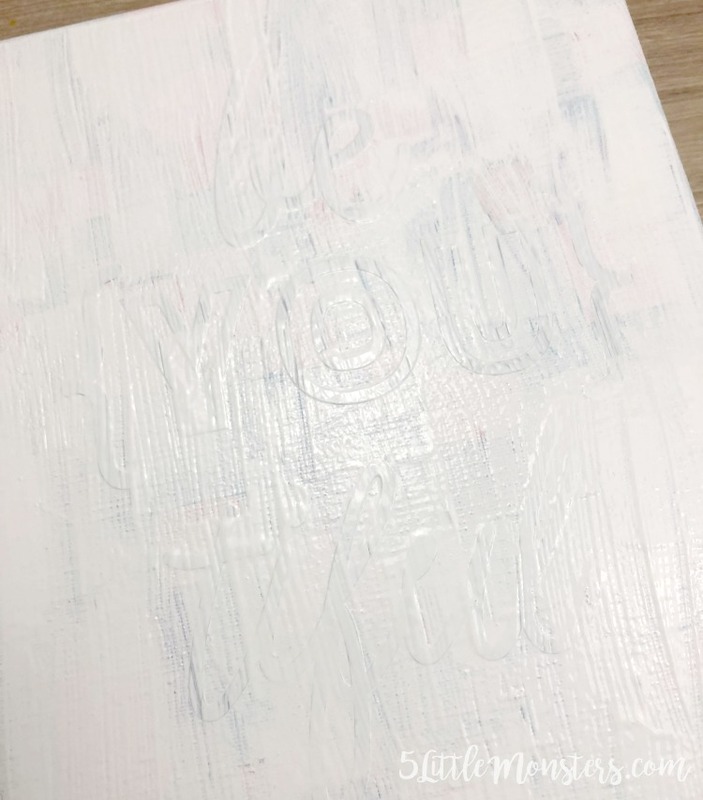 Use the foam brush to cover the entire canvas with white paint. You can do 2 coats if necessary. I wish I had done a second coat on mine because I could see through in some areas to the colors below. Carefully peel the vinyl off of the canvas. I used a weeding tool to help with this step and it made it a lot easier. This was a fun technique to try and it is easy enough that my girls wanted to give it a try. I think even I could handle this! I see so many pretty canvases in the craft stores that would serve as inspiration. I love how it turned out, if you remember, I had to ask you all about it in person! I liked it with the gold lettering on the colored background as well!